Meanwhile Kal is flying over the Atlantic looking for Lois who is in England. When he lands in England we see just how emaciated he looks with his ribs showing through his clothes. We also see that London is a mess. There are bodies in pieces all over the place. He finds Lois and saves her as she is about to be captured or killed by Amazonians. Kal wants to take Lois somewhere safe, but she feels compelled to stay to finish her mission. Subject Zero finds Kal and Lois talking and Zero plans to kill both of General Lane's "children" when Kal begins to fight the giant, very powerful foe. Zero feels that he is on a mission to be the only Superman and he wants to rid the world of all the powered aliens to protect the world. Lois tries to talk sense into Zero with no luck. She also tries to get Kal to run away and save himself. Kal tells her General Lane said "we have to protect the world from monsters". Kal and Zero get locked in a grapple and Zero is trying to get Kal to "let go" of his attachments. Zero tries to kill Kal by releasing energy but we begin to see Kal getting confident and unaffected by the onslaught. We then see Kal punch a hole through Zero's torso, and there is a massive explosion. We don't see Zero for the rest of the comic, and surprisingly they don't mention if he dies or lives. Kal sees Lois has been injured by the explosion, and she tells him to fight on not because of her, but because it is the right thing to do. Lois dies in his arms, and we see Kal holding her in a way that conjures the famous Crisis image of Superman holding the dead Supergirl. With a look of anger, Kal says that "Today I must be a Superman". This story is to be continued in Flashpoint #5. Story - 3: I enjoyed the story, and there was enough good to overcome the bad. I felt like there were some really good ideas, but it was just poorly executed. There was also a problem with the coordination between the different tie-ins and main event. We had a rushed fight scene, a rushed conversation between Lois and Kal, and a poor excuse for an escape from the Phantom Zone. I can't really fault the writer completely though, it must be frustrating to try and cram all this in three books. Art - 4: There were some really great X-ray shots again in this one, and I really enjoy when they incorporate the blur look of fast moving objects as well. The frame with Big Ben looked really nice, as well as the energy battle towards the end. We do have many weak or rushed frames throughout this story, with the most obvious one being the Crisis homage on the last page. I should drop it another point just for that one picture. 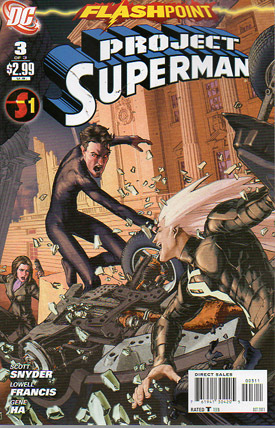 Cover Art - 2: The battle scene on the cover is OK, we see that Kal and Zero are definitely facing off in this story. Why is it that Lois on this page looks completely different than in the book or her tie-in? I'm serious, cover up the hair and clothes and I think they stuck a picture of Kal's face on hers.